recommended. The cost is 2-3 times that of a single-feed scanner, but the time savings – from several minutes for a modest batch of 50 checks, to half a day for some of our larger clients – makes up for it within the first month or two. For up to 50 checks per day, a low-cost, single-feed check scanner such as the CheXpress CX30 is the right choice. The CX30 can scan a check in about a second – but realistically, the time it takes to manually sort and feed each check adds a few seconds to the process, so a model with an automatic feeder is recommended for higher volumes. For small numbers of checks, you may be able to use your own scanner or all-in-one printer. The advantage is that it costs nothing; the drawback is that each check has to be scanned, flipped over, and then scanned again on the back to create a legal image. Our customers commonly tell us that the user experience starts to deteriorate at about 10 checks per day, which is when they start looking for a dedicated check scanner. (Note: Not all banks allow off-the-shelf scanners because most lack the ability to read magnetic ink, or MICR. To learn more about MICR, follow the link). For occasional use, some banks offer mobile remote deposit, which is usually distributed in the form of a smartphone app that uses your phone’s camera to make an image of the check. While this is convenient (and in many cases, free! ), not all banks offer it, and there are often limits on the number and the dollar amount of checks that you are allowed to deposit. Before you sign up, it’s always a good idea to ask your bank which check scanners are compatible with their software. 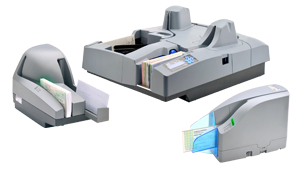 Digital Check products are supported by most banks; however, some require certain models, or specific features such as inkjet endorsing. Don’t be sorry – find out first! Who can use remote deposit? Where do I sign up for remote deposit?